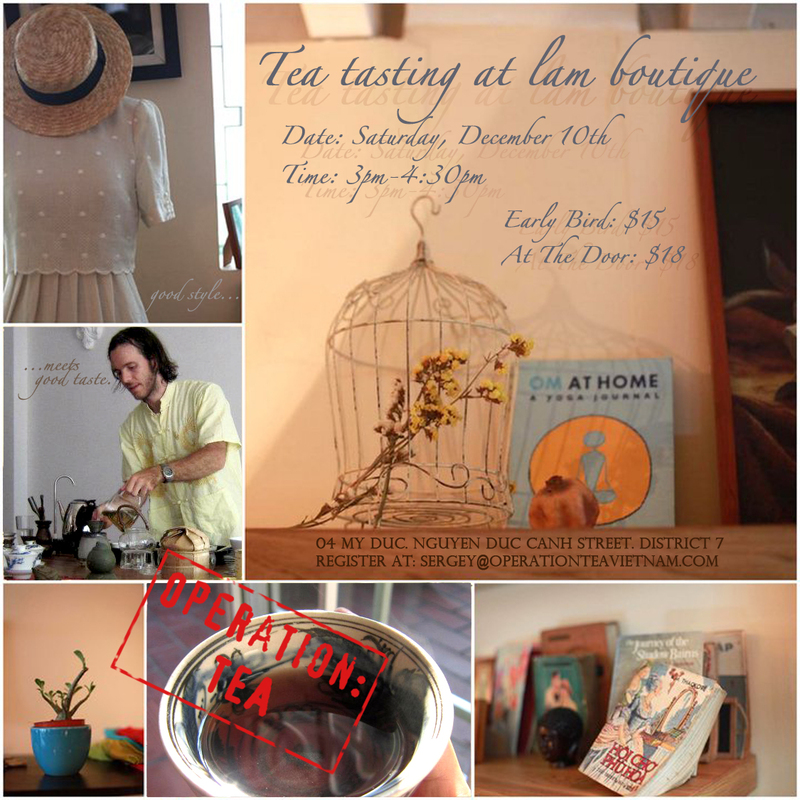 Tea Tasting at Lam Boutique | Hello Saigon! I love drinking tea! But now that I’m pregnant, I can’t drink as much. But for tea lovers out there, you are invited! Read on the invitation below! As the green plastic trees popping up in storefront windows would like to remind us, the holiday season is almost here. With the holidays comes shopping and with shopping comes stress. Operation: TEA is here to help! Order any of our teas or tea ware and we will deliver it to your home or office personally. Stay relaxed and check out our tea selection online. We also have a great new tea tasting event next month, as well as a couple of new products in our store. We will be conducting a gourmet tea tasting event. Bring your palette and your spirit alive by trying a variety of teas from around the world while you learn about their history, health benefits and the art behind their cultivation. The price is $18 at the door or $15 if you register early. Reply to this email if you would like to register. Address is 04 My Duc, Nguyen Duc Canh Street, District 7. Like them in Facebook or follow them in Twitter. You can also keep yourself updated on their events in Operation: Tea. This entry was posted in Event and tagged Lam Boutique, Operation: Tea, Phu My Hung, Tea Tasting. Bookmark the permalink.